In the early 1960's, science -fiction fans of all ages watched and listened intently to Rod Serling as he introduced each weekly episode of The Twilight Zone, CBS television's super hit. Rod Serling delivered the strange prologues in his cool, unhurried voice, leading the viewers into a wonderful world of imagination. His dark features, intense eyes and riveting posture were perfect compliments to his mysterious overall demeanor and reflected the feel of the show itself. Tim Beasley, a national variety celebrity emcee performer and unique Rod Serling impersonator, recreates that Rod Serling mystique in a very personal way. He's a first generation fan, and credits Rod Serling and The Twilight Zone with super-naturally charging up his young imagination to become years later, a galaxy of famous folks in his celebrity impersonation shows known collectively as Tim Beasley's Celebrity Stars (See homepage). Those Friday night Twilight Zones at 10PM were a favorite in the household of young Tim Beasley, who joined the millions of fans watching in the eerie glow of the original black & white broadcasts. As a major fan, Tim would recognize the visual and verbal elements of Rod Serling, so he could become, just like in a Twilight Zone episode, a Rod Serling clone. 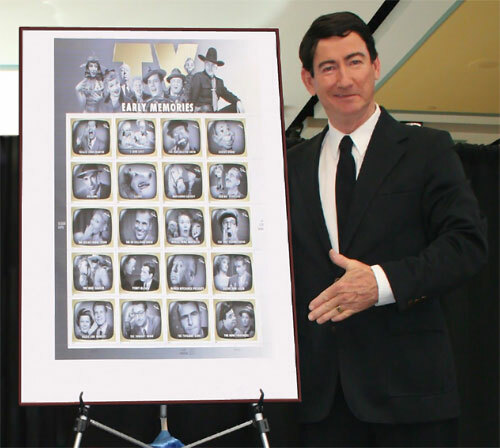 Recently the US Postal Service contacted Tim to perform as 'Rod" and unveil the new " TV Early Memories Stamps Collection," for its public premiere on 8-11-09, and also covered by the news media. The collection featured a variety of the classic black and white programs of the '50s and '60s, which included Rod Serling's face as the icon for "The Twilight Zone." The Wave House - Adult water fun park, San Deago, CA, "Dead Can Shred"
collective on classic b&w TV shows. "Michelle's Twilight Zone Party," NJ. Echoes of Time - Virginia Beach, VA - TV commercial. Cool 105.3 FM - "Car-tunes" daily radio variety comedy feature. Having a fun party, special event, retail promotion or corporate social celebrating the supernatural, like Friday the 13th, or just a fun flashback to the 60's, time-warp style? Tim can emcee the event, and he also bring along a few of his other celebrity stars to entertain in spotlight performances (see home page). Let Tim as Rod Serling be your conductor on the tracks to another dimension of party fun!